USS Wasp (LHD 1) is a U.S. Navy multipurpose amphibious assault ship, the tenth to bear the name, the flagship of the Second Fleet and the lead ship of her class. She was built by the Ingalls Shipbuilding division of Litton in Pascagoula, Mississippi. The Navy-Marine Corps team's newest amphibious warship has as its primary mission the support of a Marine Landing Force. USS Wasp and her sister ships are the first specifically designed to accommodate new Landing Craft, Air Cushion (LCAC) for fast troop movement over the beach and Harrier II (AV-8B) Vertical/Short Take-Off and Landing (V/STOL) jets which provide close air support for the assault force. Wasp, which is 257 m long (843 ft) with a beam of 32 meters (105 ft), also accommodates the full range of Navy and Marine Corps helicopters, conventional landing craft, and amphibious vehicles. Commissioned in July 1989, the Wasp has proven to be effective in several conflicts. It was also used in late 2011 as a test ship for carrier trials of the F-35B. 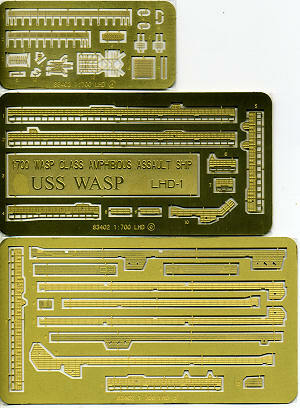 Even in 1/700 scale, the Wasp is a large ship with a flight deck measuring 14 inches. The kit is designed as a full hull model, though by leaving the lower section off, you can essentially make it into a waterline version. The kit comes with three nicely done photo etch frets. These are used for radars, catwalks and a few other bits and pieces throughout the ship. In some cases, such as the radar, the p.e. is used as an optional replacement for the injected plastic parts. Most will choose to go with the photo etch as it just looks better. The set even includes a brass name plate to install on the stand. Also included with the kit are a myriad of additional vehicles, boats and aircraft. In fact, I dare say that half the parts count is in these pieces. One gets Ospreys, Sea Knights, Sea Stallions, Harriers, Sea Hawks and Cobras for aircraft with some of the rotary wing types, specifically the Ospreys and Sea Knights, having optional folded blades. Most of the aircraft if not all are molded in clear plastic as it apparently the norm nowadays. LCACs and LCUs are also part of the kit, even though the rear opening to the ship is designed to be molded closed. 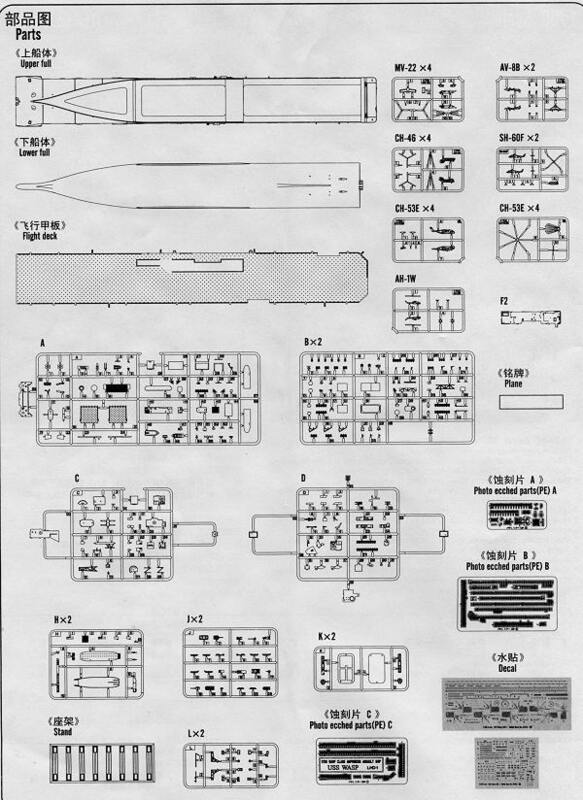 For those you have HMMVs, tanks, trucks, LAV-25s and even a few AAVP-7s that can be used as cargo. Instructions are well done and indicate where the optional pieces are to be used. A few mods need to be done to the kit bits and those are also clearly shown. A full color painting and markings guide is provided that also includes painting of all the aircraft and vehicles included. 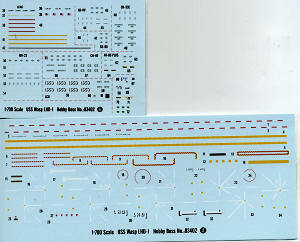 The decal sheets are well printed and give not only ship, but aircraft markings as well. 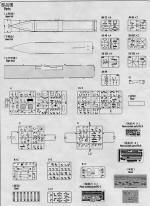 Overall it will make into a large and most impressive model of one of today's naval ships. All the detail is there that you might want and the inclusion of the photo etch bits will just make it that much more realistic. Thanks to Squadron Products for the preview kit. You can pick yours up at your local hobby shop or have them order it for you.